Floor air conditioner is another type of air conditioner unit that is commonly used in places such as restaurants, halls, motels, data centers. The reason for its name is obvious in that it is basically standing on the floor. Other types of indoor units are the wall mounted, ducted, ceiling exposed, portable and window. These fan coil units are all located indoor. The outdoor unit or condensers are located outside the building where the heat is rejected through the vapor compression cycle. These two units are all that are required for the air conditioning system to function. They are connected to each other through the cooper tubes which are the gas and liquid lines. The cooling capacity of the floor air conditioner can range from 24,000 Btu/hr to 200,000 Btu/hr depending on the model. There is also the inverter and non-inverter type with the inverter type commanding a better performance but more costly. Here are some of the brands that you may encounter for this type of unit. A MIDEA floor standing unit. As with many air conditioners equipment, you have a choice of the type of refrigerant that is being used. R22 is the older and most cost effective but this refrigerant is not ozone-friendly and its production has been stopped. Due to recycling program, this refrigerant is still available but will be totally phase out by 2030. The more ozone-friendly refrigerant include R407C and R410A. 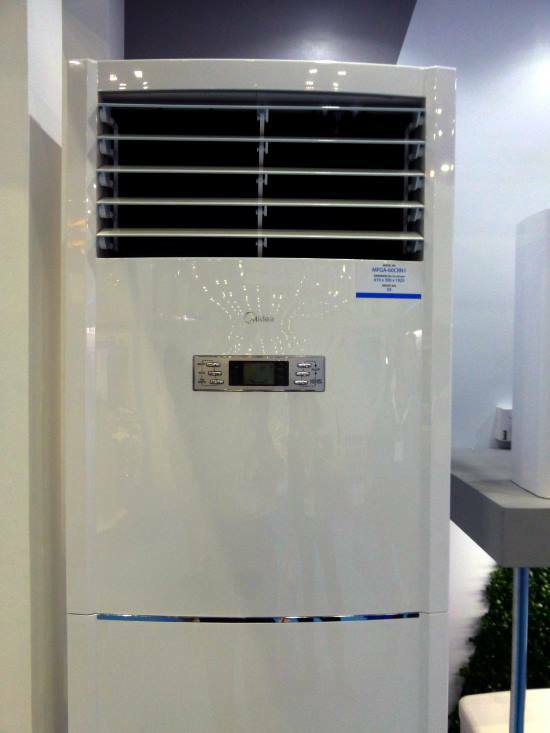 Many manufacturers are producing these air conditioners and selling them in the market. However, it was discovered that these refrigerants can cause global warming. A newer refrigerant that has less global warming effect is the R32. Shop around and choose one that fits your requirements. The ionizer feature is offered by some brands. These ionizer feature helps to get rid of pollen, dust and other particles to create a cleaner air in your room. This feature is widely available in most units but it is good to confirm its availability on the floor air conditioner unit that you have chosen. It basically remembers most of the settings that you set before the power failure occurred. Once the power is restored, it will be operating in its previous settings without you having to set it all over again. Check the specifications of the sound level emitted by the indoor unit and outdoor unit. The indoor unit's sound level will be heard by the people in the room and should be as low as possible for the same capacity and fan speed. For instance, the maximum sound pressure could be 52dBA and minimum of 47dBA for a 24,000 Btu/hr unit. The outdoor unit's sound level is usually higher than the indoor unit and may affect your neighbors. Therefore, besides looking at the sound level, make sure the installers installed the unit properly based on the manufacturer's recommendation. The electricity consumed by the air conditioners is probably the highest in your house. Selecting a more power efficient air conditioner will greatly reduced your spending on power utility bill. Take note of the energy star sticker or the brochure of the air conditioner. The SEER is used to determine its efficiency. The higher the value, the more efficient it is. Choose an energy saving model such as an inverter unit if you have the budget. If you have budget constraint, choose a unit that consume the least power for the same capacity. Different manufacturers will have different data and it can be found in the brochures provided. For example, a non-inverter, 36,000 Btu/hr unit may consume a total power of 3.8-4.0 kW. See also the typical features of a portable air conditioner.